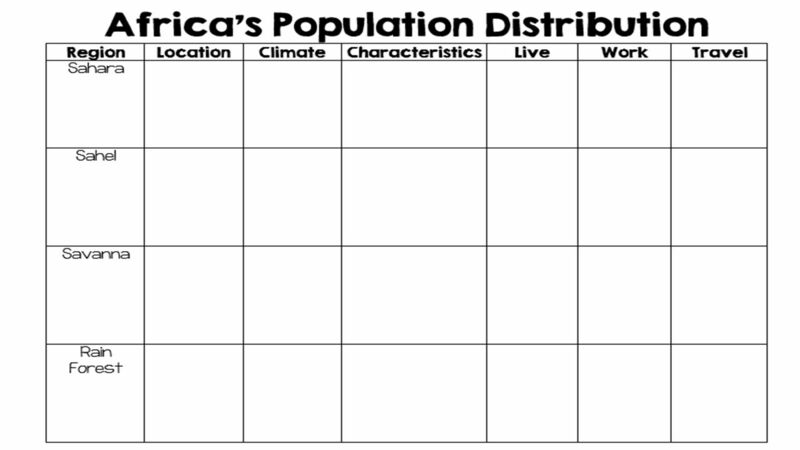 2 Standards SS7G3 The student will explain the impact of location, climate, and physical characteristics on population distribution in Africa. a. 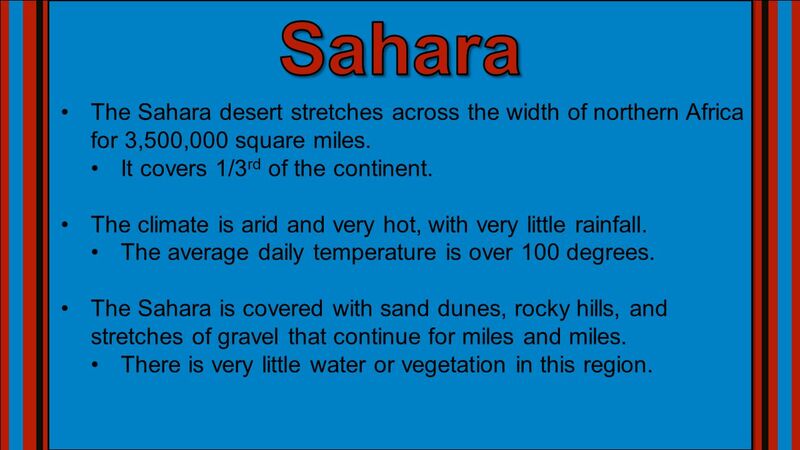 Explain how the characteristics in the Sahara, Sahel, savanna, and tropical rain forest affect where people live, the type of work they do, and how they travel. 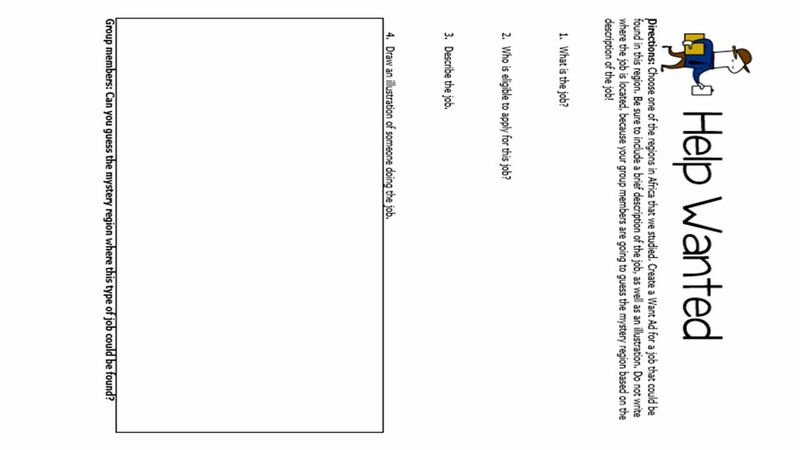 3 Teachers Print off the following page for each student. 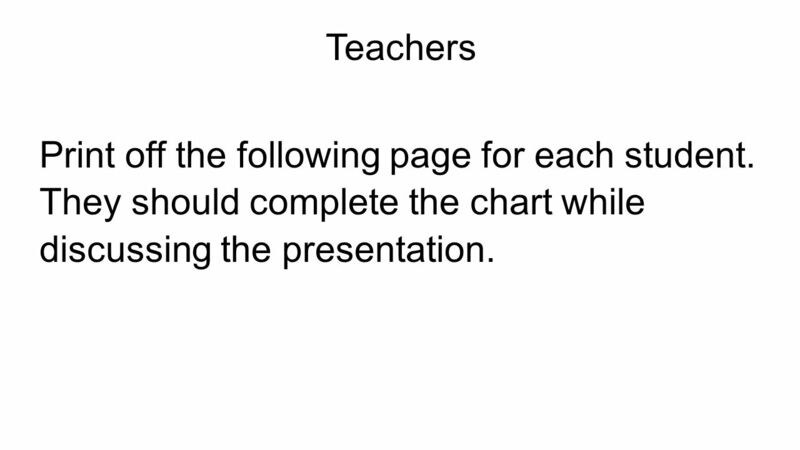 They should complete the chart while discussing the presentation. 6 Sahara The Sahara desert stretches across the width of northern Africa for 3,500,000 square miles. It covers 1/3rd of the continent. The climate is arid and very hot, with very little rainfall. The average daily temperature is over 100 degrees. 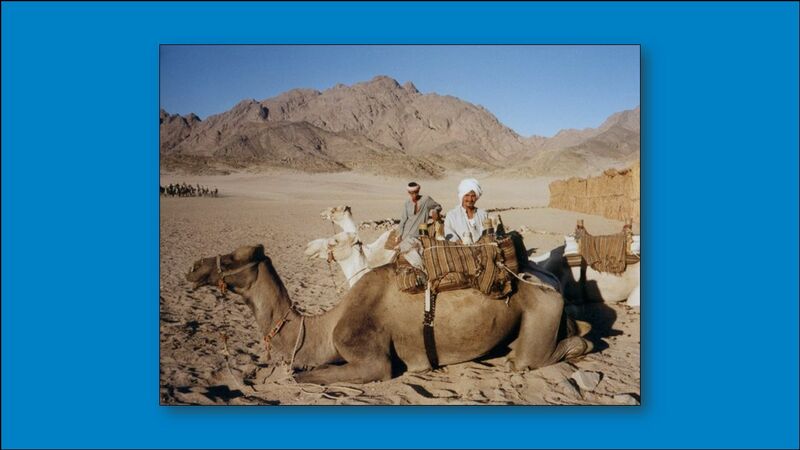 The Sahara is covered with sand dunes, rocky hills, and stretches of gravel that continue for miles and miles. There is very little water or vegetation in this region. 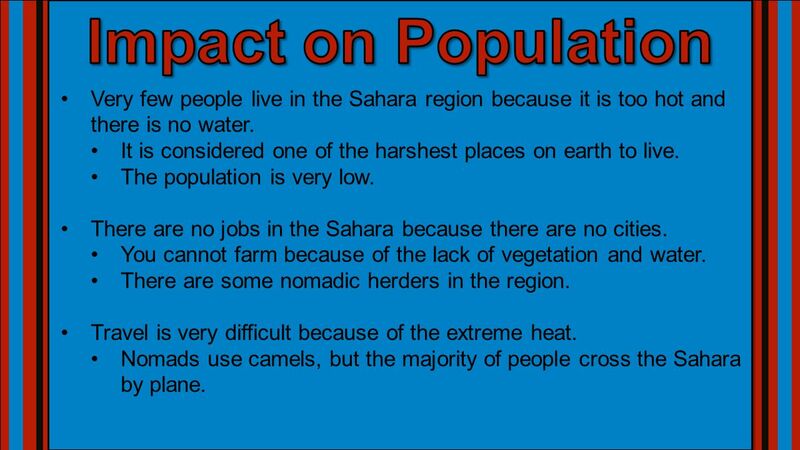 8 Impact on Population Very few people live in the Sahara region because it is too hot and there is no water. It is considered one of the harshest places on earth to live. The population is very low. There are no jobs in the Sahara because there are no cities. You cannot farm because of the lack of vegetation and water. There are some nomadic herders in the region. Travel is very difficult because of the extreme heat. 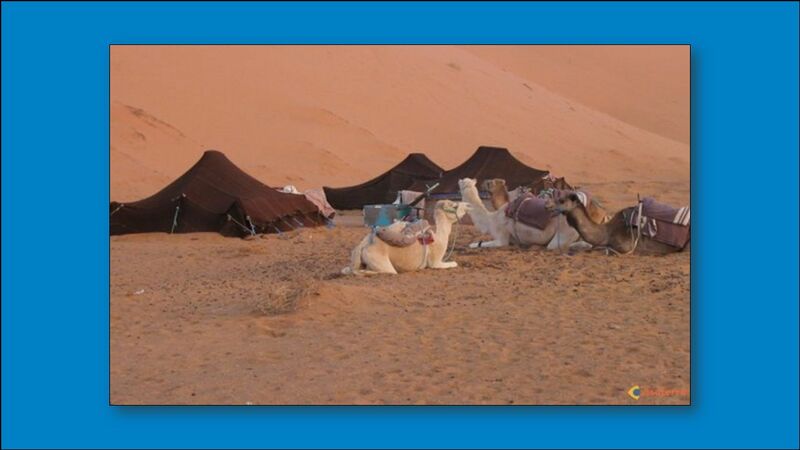 Nomads use camels, but the majority of people cross the Sahara by plane. 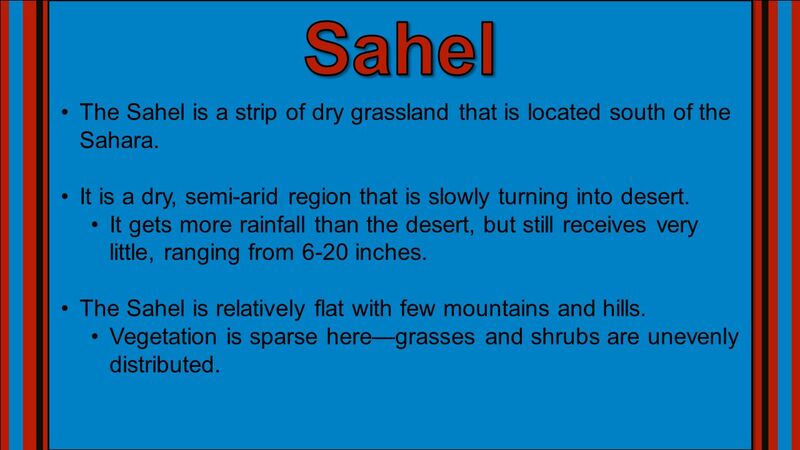 11 Sahel The Sahel is a strip of dry grassland that is located south of the Sahara. 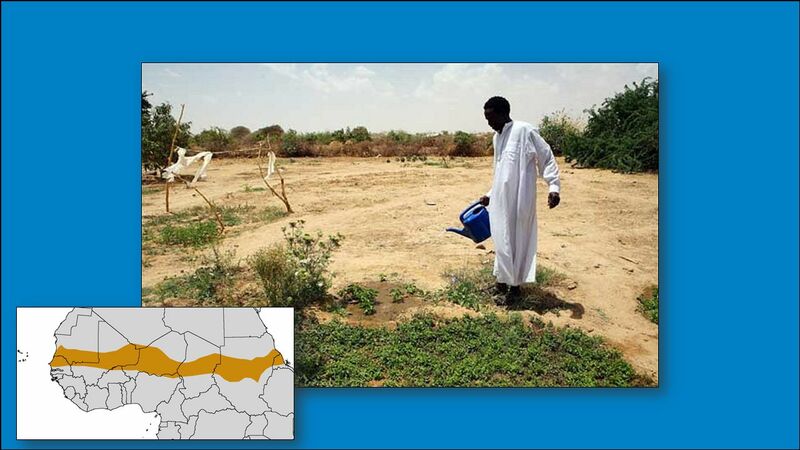 It is a dry, semi-arid region that is slowly turning into desert. It gets more rainfall than the desert, but still receives very little, ranging from 6-20 inches. 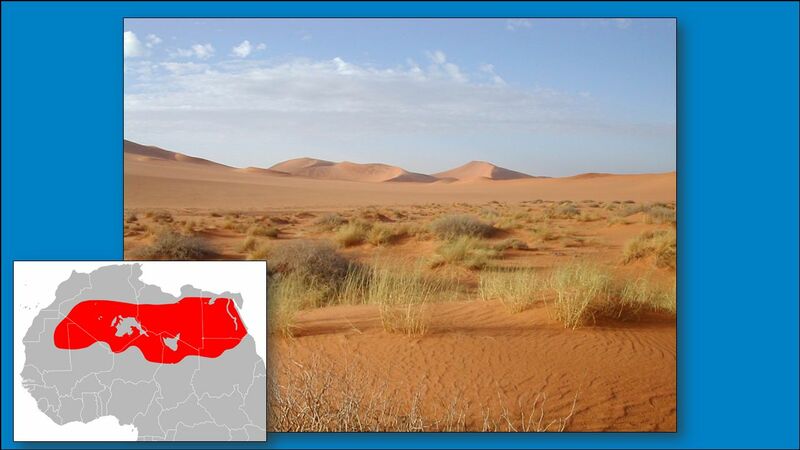 The Sahel is relatively flat with few mountains and hills. Vegetation is sparse here—grasses and shrubs are unevenly distributed. 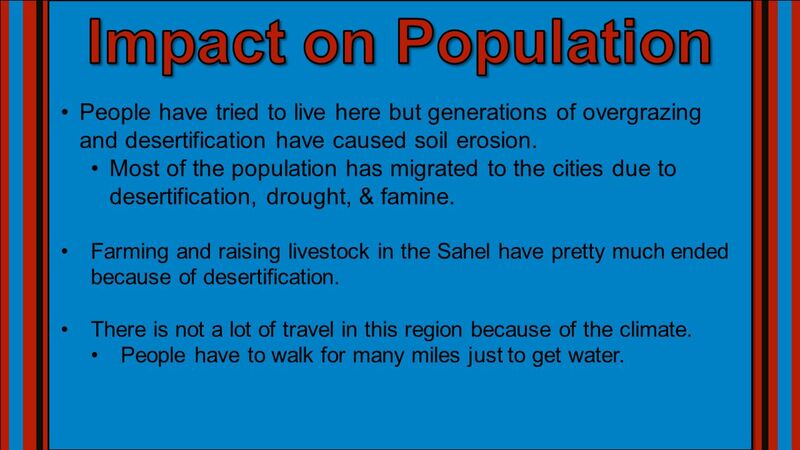 13 Impact on Population People have tried to live here but generations of overgrazing and desertification have caused soil erosion. 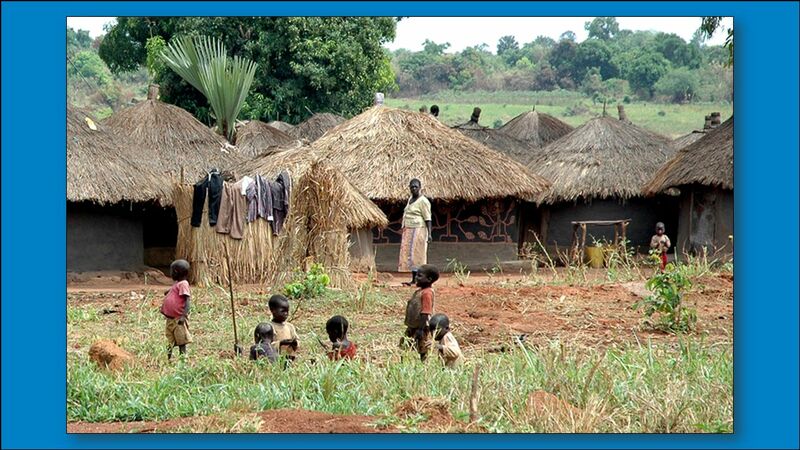 Most of the population has migrated to the cities due to desertification, drought, & famine. 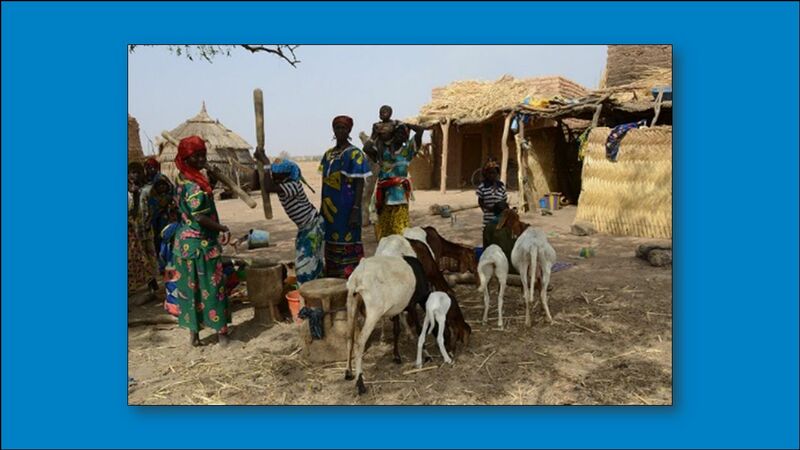 Farming and raising livestock in the Sahel have pretty much ended because of desertification. There is not a lot of travel in this region because of the climate. 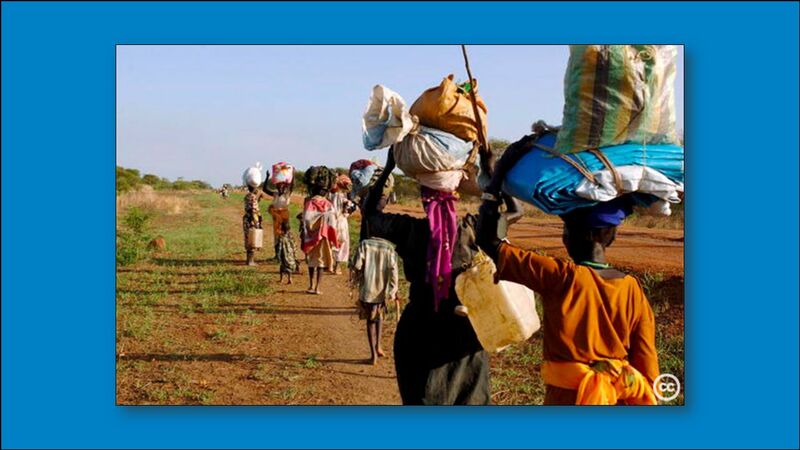 People have to walk for many miles just to get water. 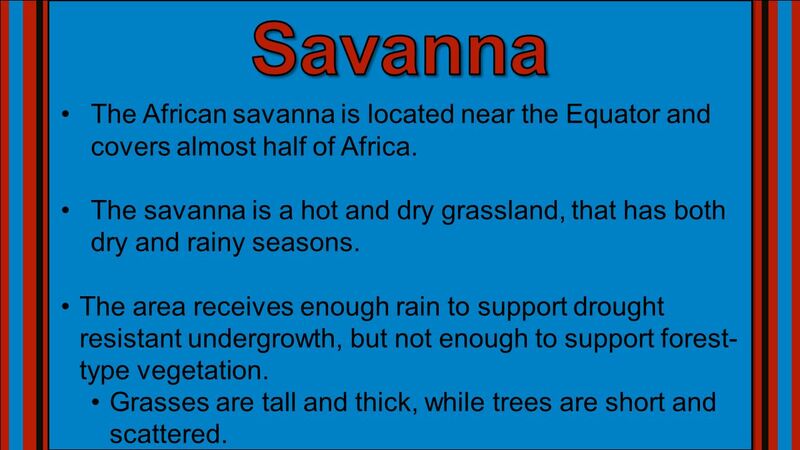 16 Savanna The African savanna is located near the Equator and covers almost half of Africa. 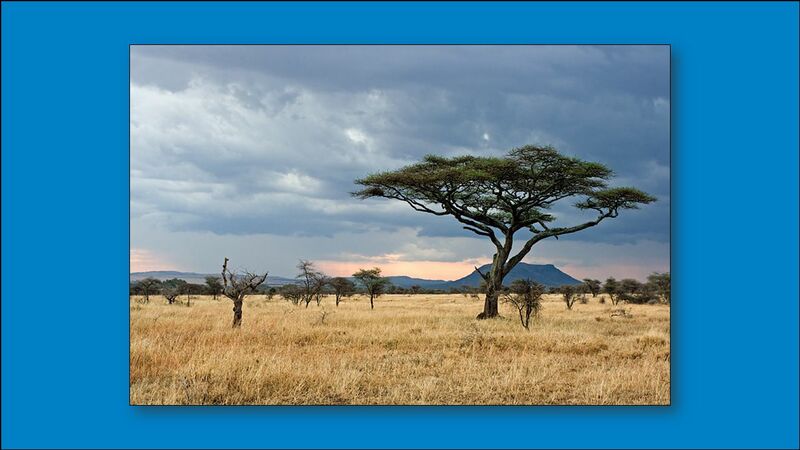 The savanna is a hot and dry grassland, that has both dry and rainy seasons. The area receives enough rain to support drought resistant undergrowth, but not enough to support forest-type vegetation. Grasses are tall and thick, while trees are short and scattered. 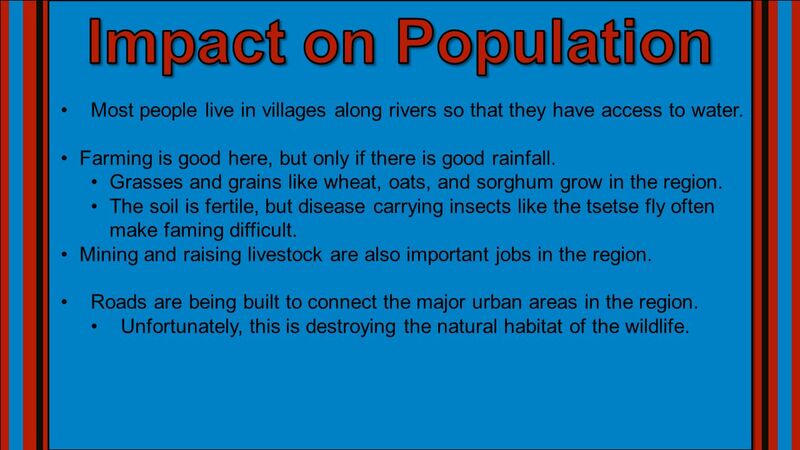 18 Impact on Population Most people live in villages along rivers so that they have access to water. Farming is good here, but only if there is good rainfall. Grasses and grains like wheat, oats, and sorghum grow in the region. 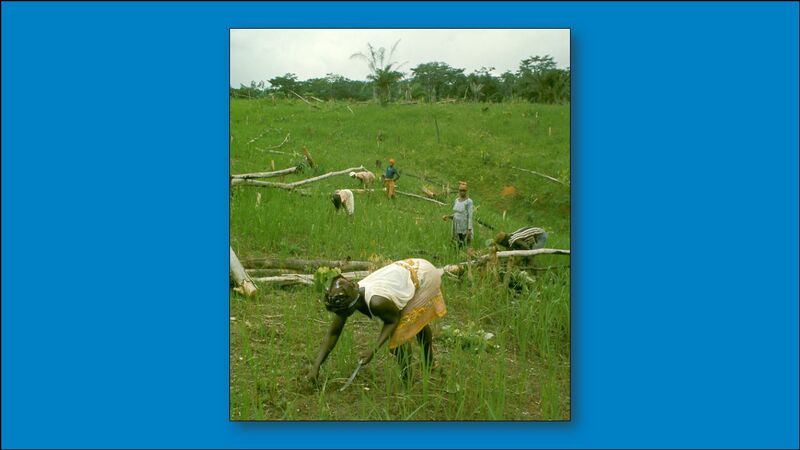 The soil is fertile, but disease carrying insects like the tsetse fly often make faming difficult. Mining and raising livestock are also important jobs in the region. Roads are being built to connect the major urban areas in the region. Unfortunately, this is destroying the natural habitat of the wildlife. 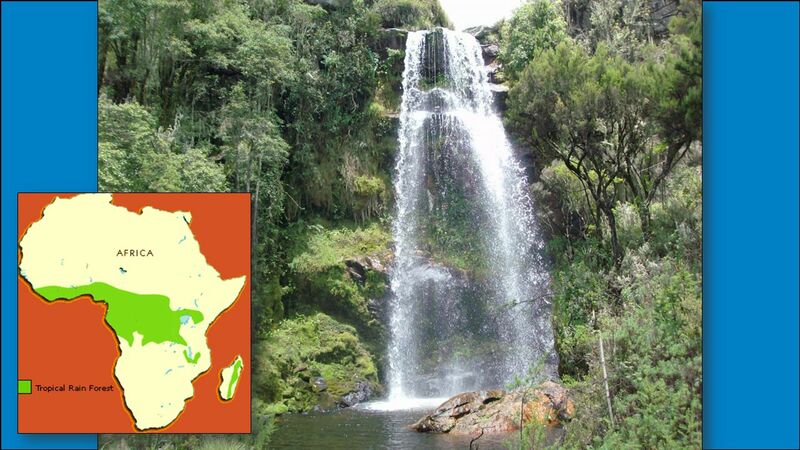 21 Tropical Rain Forest Africa’s tropical rain forest is located along the central coast of Africa, near the Equator. 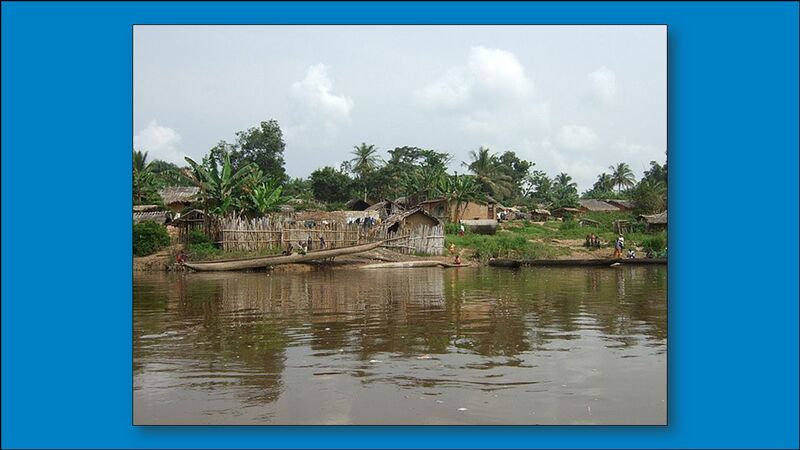 It lies in the Congo River Basin. It touches 37 countries in Africa. 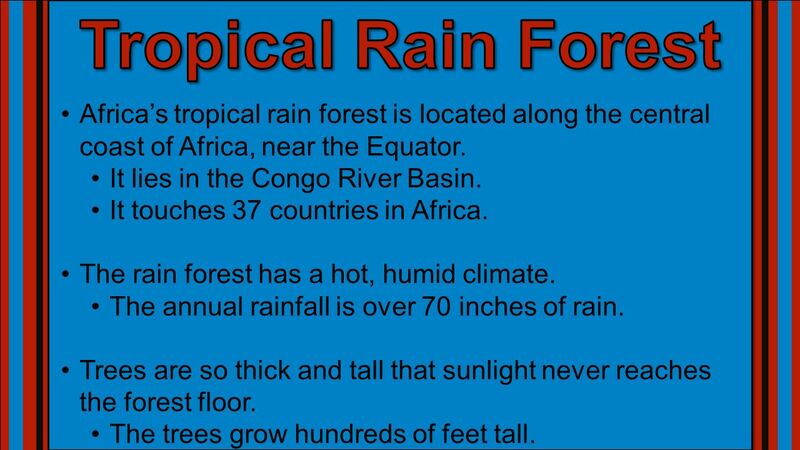 The rain forest has a hot, humid climate. The annual rainfall is over 70 inches of rain. Trees are so thick and tall that sunlight never reaches the forest floor. The trees grow hundreds of feet tall. 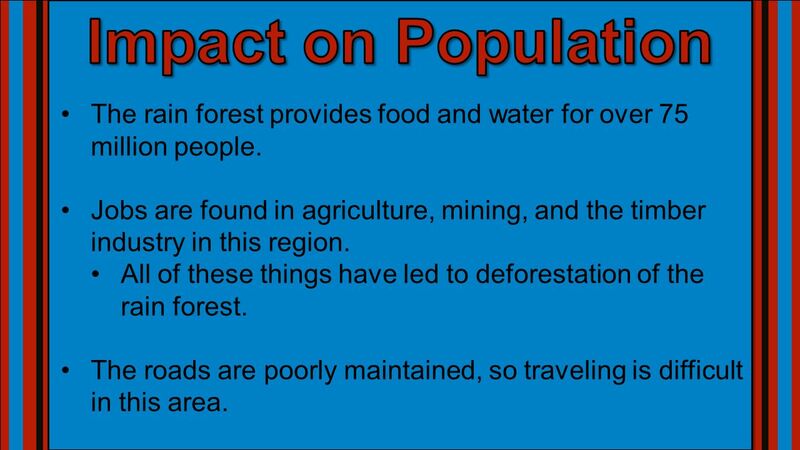 23 Impact on Population The rain forest provides food and water for over 75 million people. Jobs are found in agriculture, mining, and the timber industry in this region. All of these things have led to deforestation of the rain forest. The roads are poorly maintained, so traveling is difficult in this area. 30 Teachers Thank you for downloading this file. I hope you enjoy using it with your students, and I can’t wait to read your feedback in my TPT store! 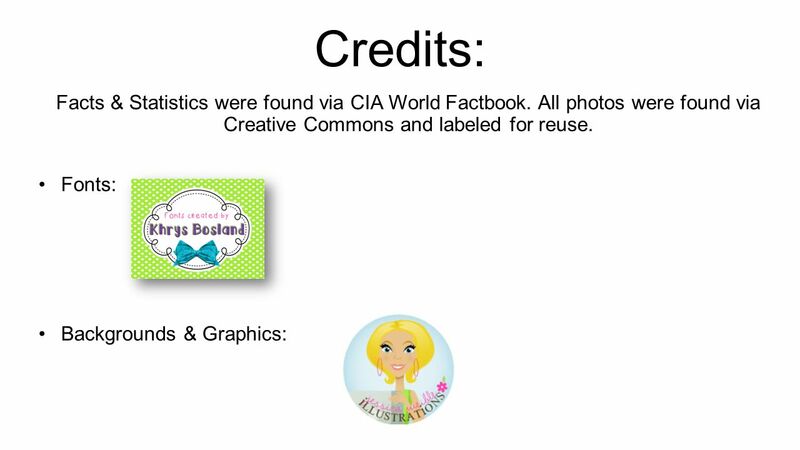  For more social studies materials, please visit my store: I teach Language Arts and Social Studies in Georgia, so my products are aligned with Common Core (LA) and Georgia Performance Standards (SS). © Copyright 2013. Brain Wrinkles. All rights reserved. Permission is granted to copy pages specifically designed for student or teacher use by the original purchaser or licensee. The reproduction of any other part of this product is strictly prohibited. 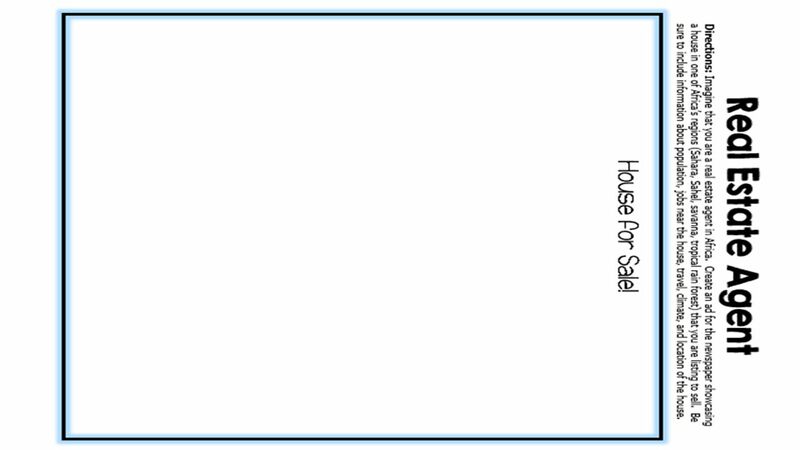 Copying any part of this product and placing it on the Internet in any form (even a personal/classroom website) is strictly forbidden. Doing so makes it possible for an Internet search to make the document available on the Internet, free of charge, and is a violation of the Digital Millennium Copyright Act (DMCA). 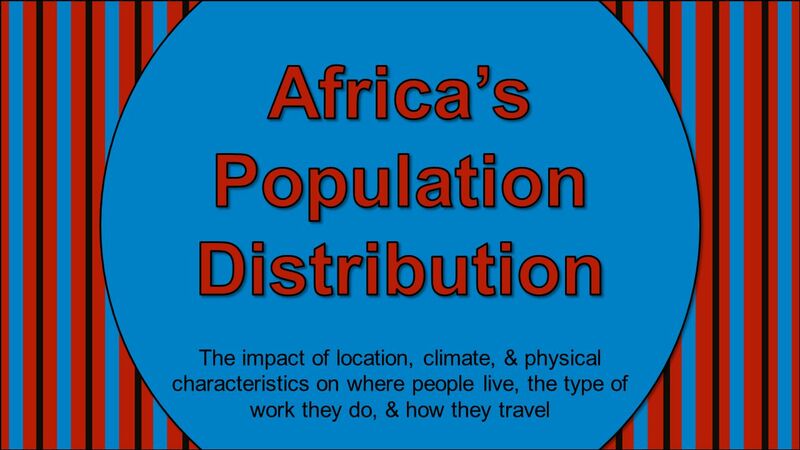 Download ppt "Africa’s Population Distribution"
The Geography of Africa. The Continent of Africa Second largest continent in the world 4,600 miles East to West 5,000 miles North to South 1/5 of earths. The impact of location, climate, & physical characteristics on where people live, the type of work they do, & how they travel. Read each question and its choices and decide which is the correct answer. AFRICA GEOGRAPHY UNIT 1 REVIEW. Along the Nile River. 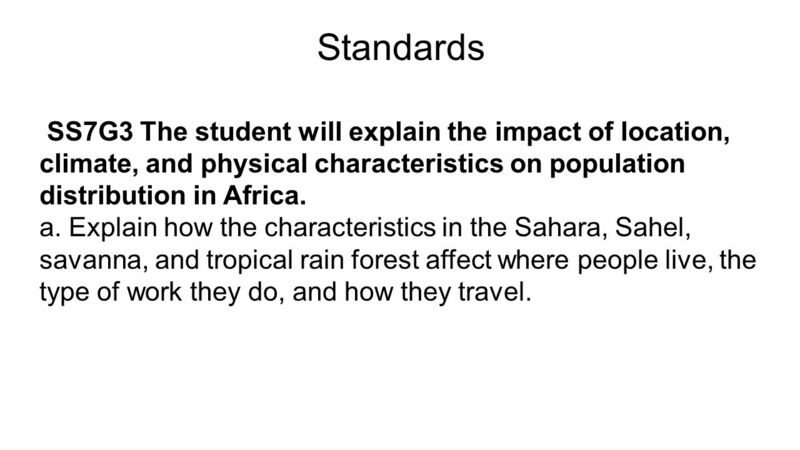 7th Grade UBD – Unit 2 – Africa. 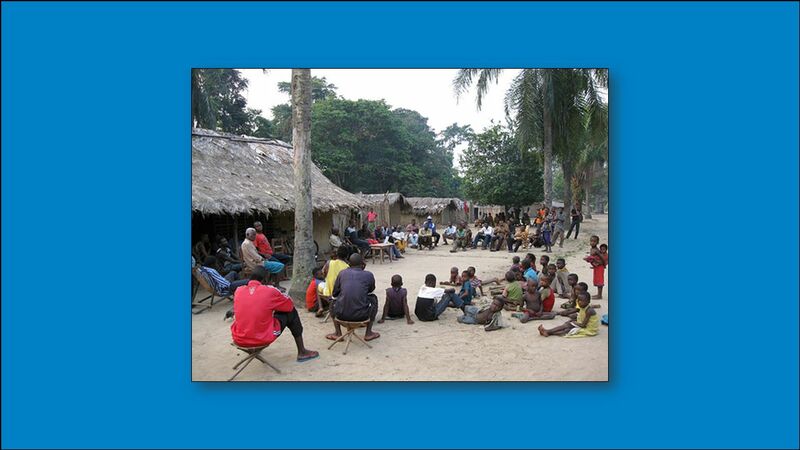  Africa’s Diverse Population- Most Africans live in places where trade, industry, climate, soil, or natural resources. 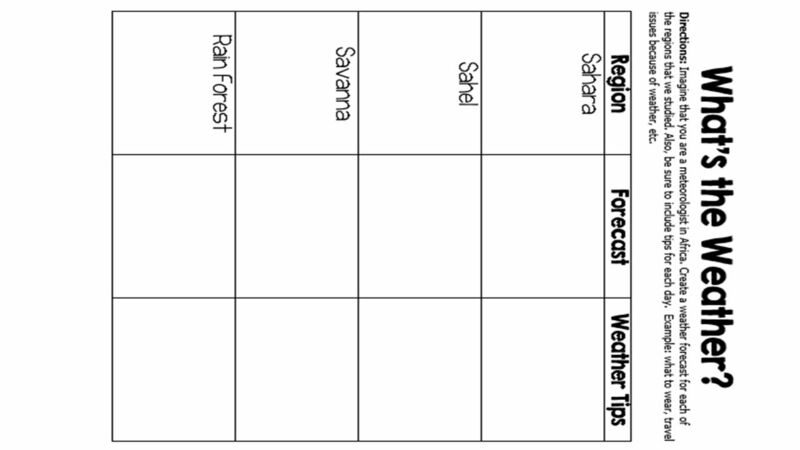 African Vegetation Patterns. Vegetation Zones –The majority of Africa lies within the tropics –Wet near the equator –Drier moving north and south.